Red clay dirt. Hills. Double obstacles. Injuries. Almosts. 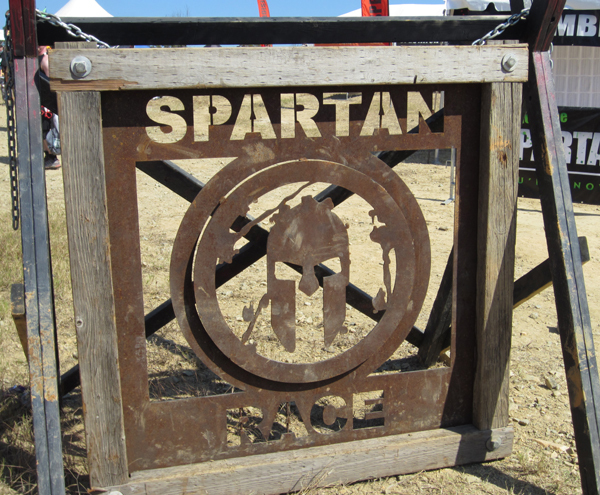 That is my 8-word description for the South Carolina Spartan Beast Race in Winnsboro, SC. Let me just say upfront that this course was one of my favorites. My performace was the least satisfying of all, but I’ll come back to that. The location was easy to get to, there was plenty of parking within close distance of the festival area, and the terrain was absolutely fabulous. Uphill, downhill, uphill, downhill, uphill, downhill and repeat over and over and over again. Most of the course was in the woods making the running portion scenic if nothing else. There were several runs through and along a sandy creek, which was fun and provided an interesting running surface that contrasted with the hard packed clay trails prevalent throughout. The obstacles were well-placed and many were repeated. Two rope climbs, two atlas carries, two sets of jumping logs, two sets of moats, two sets of barbed-wire crawls (including the last very heinous one that went straight up a hill). If I were asked to pick a Beast race that I could perform well in if healthy, this one was it! Soooo, how did the race go for me? Well, I started slowly, gradually testing my knee and foot and it didn’t take long to realize that my knees weren’t completely recovered from the Ultra Beast as they started hurting early from the stress of the hills. It’s a good thing that I didn’t go to South Carolina to compete at the highest level. I went because I love the sport, the people, the atmosphere, and simply because I can. You’re going to hear that theme from me a lot in the future. The first half was by far the easiest with regard to obstacles. I breezed through the monkey bars, walls, log jumps, rope climbs, and traverse wall (well, almost). I concentrated and took my time, and made it to the last foot and handhold. As my mind started entering celebratory phase, I reached to ring the bell that signalled success. At that very instant my right foot slipped a little, the trajectory of my reach changed, and I waved at the bell missing it by less than an inch as my foot hit the ground. The volunteer smiled as he yelled out…”30 burpees”! Uggh! Margaret Schlachter caught up with me right after that and we ran together for a little while until we reached the barbed wire crawl. I have concluded that Margaret goes under barbed wire like a raccoon being chased by hounds….very quickly! This is the second race that we’ve been together at the start of barbed wire and the second time that she came out way ahead of me. Soon after I had the pleasure of running alongside Gretchen Krueger and Sue Luck for short distances. I had just met Gretchen and her husband, Dan, the night before at dinner and like me, she was nursing some performance-inhibiting injuries. If you haven’t read Sue’s story about running the Ultra Beast and the Beast on consecutive days, you should. It is incredible! About this time I started to pick up some speed and slowly started regaining some of my more high-speed reckless running on the downslopes. I began passing people one at a time and estimated that I had made my way up to maybe 50th or 60th place by mile 10 (maybe it was 11) when I reached the tyrolean traverse. This is where the proverbial wheel fell off! During a short wait in line for this obstacle, I decided on an over-the-top strategy, but this time utilizing my left leg as the counter-balance. In Vermont, I was successful with the traverse obstacle using the other leg, but I ended up with some considerable soft tissue damage along my right leg and groin area. I made it about halfway across the traverse when the tension on my groin caused me to shift and flip under. I hung on and started making my way across upside down, but after a few feet, I felt a sharp pain in my left hamstring. I tried moving my legs again, but the hamstring was unrelenting. I just hung there…for what seemed like forever. I attempted to move again, but the pain was too much, I lost my grip and dropped into the cold water. I immediately swam back to the beginning of the rope to start again. Now I was in an even longer line. I decided to give the over the top one more chance. As soon as I got up though, I knew that I was risking a more serious hamstring and/or groin issue. I went a few yards, flipped, and simply gave in to prevent further injury. That was the lowest point ever of any of my races and this race was now effectively over for me. 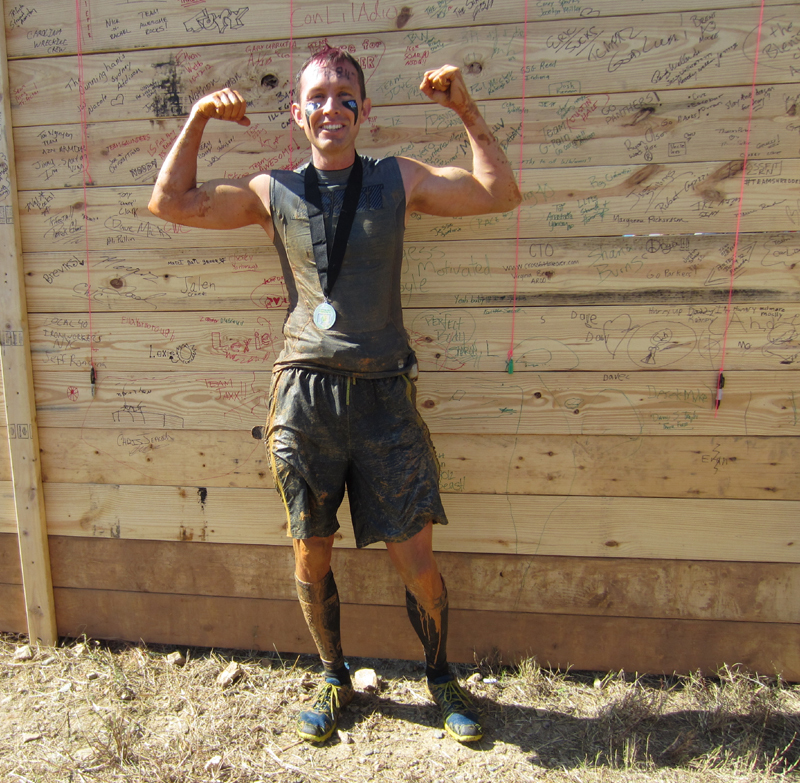 I had spent considerable energy and time at one obstacle. I tweaked/pulled/strained my left hamstring (it’s purple today!) and I had 30 more wet burpees to do. From there, I ran slowly the rest of the race. I was limited because of the hamstring and didn’t want to make it worse. As anyone who has read this blog knows, I have complained enough about injuries. I of all people don’t need another one to whine about. With about a mile to go I started cramping in my other hamstring and calf (and even my toes…that was a first). I think this mostly had to do with overcompensating, but I’m not new to cramping so I stretched when necessary and pushed on through. I finished the race by ‘almost’ making the spearing throw, but ‘almost’ doesn’t prevent the 30 burpee penalty. Thirty ugly, malformed burpees later I proceeded to the final barbed wire crawl, up the slippery wall, over the fire, and took my parting shots from the gladiators. I got the medal, but it was kind of hollow. The medal wasn’t hollow, the feeling of receiving it was hollow. I didn’t even check my finishing time and place because I knew it was horrific (ended up somewhere around 3:20). A day later, I sit here writing this and am indeed thankful that my injury is something that will hopefully heal in a week or so. My knee and foot are about the same as normal after a race…painful, but not too much. Of all the races I have run in, I have never encountered so many racers with injuries. I passed at least 6 or 7 people on the course who had hurt their ankle. At least half a dozen people came by the medical tent while I was there getting ice for my hamstring and knee. Today, I’m still hearing about people who were injured and I’m EXTREMELY thankful that I’m not much worse off than I was before the start of the race. Even with the disappointing finish, I had a great trip. My mother went along with me and I got to meet some new Spartan friends and came face-to-face with others that I had only known digitally. THAT part was great no matter how poorly the race went! Everything in perspective, right?! It’s time for me to heal now. …and now for the traditional dorky pose…complete with pink racing stripe hair in honor of Breast Cancer Awareness Month!